With the start of a new school year comes driving your children to school along with the neighbor children if you carpool. 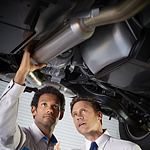 You want to know your vehicle is in as good of condition as possible. Stop at Wyoming Valley Kia and let us check it over and offer you some helpful tips. Here are some simple tips on things you can do for your vehicle. • Have tires rotated and balanced. • Check tire air pressure. • Wash all windows and make sure you have extra washer fluid. • Perform all basic maintenance like oil changes and checking other fluid levels. • Make sure you have supplies like jumper cables, jacks, flashlight, batteries, water and a first aid kit. Whether you’re a DIY type of person or want a professional to take care of your vehicle, we can help. Come to our Larksville dealership and let us show you the many automotive services and supplies we offer.